Students from Middlesex have taken part in an enterprise competition for a chance to run a stall at the University's first ever Spring Fair. The competition invited students to devise a business plan for an idea, product or service to sell on the day. The winning entries were then given £250 to develop their idea and invest in goods. Products sold by the winning students on the day will include handmade cassette tape lamps, henna design goods, masks, clothing and clutch bags. Middlesex has also reached out to the local community, with ten students from Leyton Sixth Form College in Waltham Forest, NewVic College in Newham and St Francis Xavier College in Balham all taking part in the competition, while Hendon residents have also been invited to sell their products at the event. Alongside the stalls on the day, there will be traditional fete games, a Frozen sing-a-long for younger visitors and a live busking pitch featuring some of Middlesex's music student talent. Students have also been heavily involved in the organisation of the Spring Fair, with MBA students working in collaboration with the University's Enterprise Development Hub, which provides business and employment advice for students. Among them is Co-Project Leader Elena Burykh, who said that the MBA team is applying all the skills and knowledge – including leadership, management perspectives, marketing and business strategy – they've gained from their course. 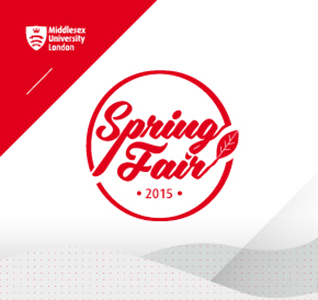 Commenting on the importance of initiatives such as the Spring Fair, Middlesex University's Education Liaison and Outreach Manager Elita Eliades-Ahmed said: "This is an inspiring event for would-be student entrepreneurs that will help get them ready for the world of business. "We have a wealth of entrepreneurial students at Middlesex, creating real pioneering designs. This will give them that platform to allow them to showcase their work to a wider audience." "We had some really creative and innovative ideas put forward by the students, and business plans that would impress future employers. It's the first time we've hosted such an event, and we are sure to see some truly unique handcrafted goods that are not available anywhere else." The Spring Fair, which is free to enter, will place on 17 April from 12 pm until 6pm.